Rosh Hashanah, means “Head of the Year”, in Hebrew, hence a New Year celebration. Rosh Hashanah begins at sundown, and lasts for two days (ex. starts at sundown on Sunday, and ends on Tuesday). It is a religious holiday, thus regular services at the synagogue, plus the use of apples dipped in honey as part of the meal, to start the New Year on a sweet note. I would like to extend my warm wishes of happiness, health and prosperity to all my friends who celebrate this holiday. I already posted my favorite Caramel Apple Dip recipe, which is perfect for Rosh Hashanah, since it contains apples and honey, and it is quite delicious. Today I will post my recipe for a Jewish Apple Cake, which was given to me by a friend a couple of decades ago. I was not sure what made this particular recipe “Jewish”, so I turned to my readers for their feedback. One reader explained that Jewish desserts are usually made without dairy, so they can be served alongside the meat dishes, which also makes it a great dessert for Hanukkah holiday. If anyone else has a different take on this theory, please share your comments. Thank you. 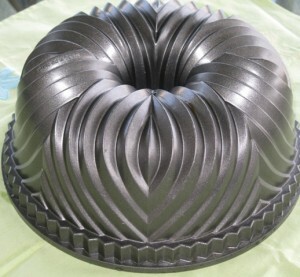 This is the baking vessel I was using to make this cake. 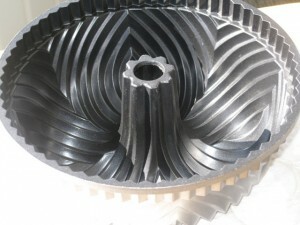 It is constructed out of heavy metal, hence does not burn the cake during the long cooking time. It needs to be greased and floured well, for easy cake removal after baking. Add cinnamon, 3 Tbs sugar, and lemon extract/juice. Fold in well, to coat the apples. In a large mixing bowl,using a mixer, mix 2 cups sugar with 4 eggs, until thickened and light creamy yellow color. Mix in oil, orange juice, salt, and vanilla extract. Slowly keep on adding to the creamed eggs, and keep on mixing until all flour is used up. Pour 1/2 of the batter into the pan. Cover with apples, and smooth the top to keep it evenly spread out. Pour in the second half of the batter, over the apples. Bake at 350 degrees F, for 60 minutes (if the top start browning too much, cover loosely with aluminum foil. Cool in a cake pan for 10 minutes, then remove onto a cooling rack until cooled completely. Sprinkle powdered sugar over the top of the cake, or sugar glaze, or caramel glaze , if that is what you like. Cut to serving pieces, and enjoy! If you like to change the texture of the filling and/or the cake ,you may add 1 cup of raisins, or craisins to the apple filling, and 1/2 cup of walnuts to the cake batter. It is low fat as well, since no butter is used…yeah! It can also be made as a sheet cake. 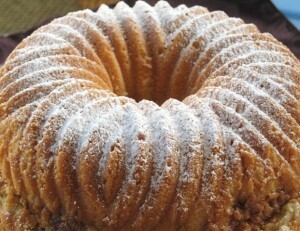 I love Jewish Apple Cake…where I used to work someone would bring it in all the time…LOVE IT! If you decide to make it, please let me know how much fun it was. Hi. 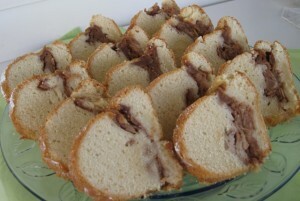 I think it is called “Jewish” apple cake because of the recipe style. Jewish deserts are often non-dairy so one can serve them with a meat meal (and not mix dairy and meat at the same meal). And Jewish apple cake is made with oil instead of dairy (butter or milk). It is also traditional for Chanukah, when is associated with oil rich dishes. Thank you so much for the clarification of the name for this apple cake. It makes perfect sense to me now, since I am aware of the fact dairy and meat is kept separate in Jewish cooking/baking. I appreciate your time reading my post, and leaving an informative comment. Can this be baked and then frozen for later use….. I wish I had this answer for you, but I really do not. I hardly ever freeze my baked goods, unless I am testing how something will hold after being frozen. I want to say that it should be fine, because the apples are protected by the cake. I would wrap it in heavy duty aluminum foil,then place it in a plastic bag, to protect it from freezer burn. I would thaw it in the fridge, still wrapped up, to prevent it from drying out. I froze my Apple Torte,which has caramel topping, and it was fine, so I am sure this will be fine as well. Please keep us posted about your experience with freezing this cake.